It is very well known that Ileostomy and Colostomy operations are associated with a very high rate of complications. These result in increased morbidity and mortality. It also increases the chances of litigation. It is important to understand what is causing the complication and what role the nature is playing in initiating the complication. Once this is understood, it is easy to reach the source of the problem and prevent the complication before it gets out of control. The Surgeon must maintain the control of the stoma at all times. The concept evolved by serendipity in April, 1986 and since then it has been used on all patients requiring an Ileostomy or a Colostomy. 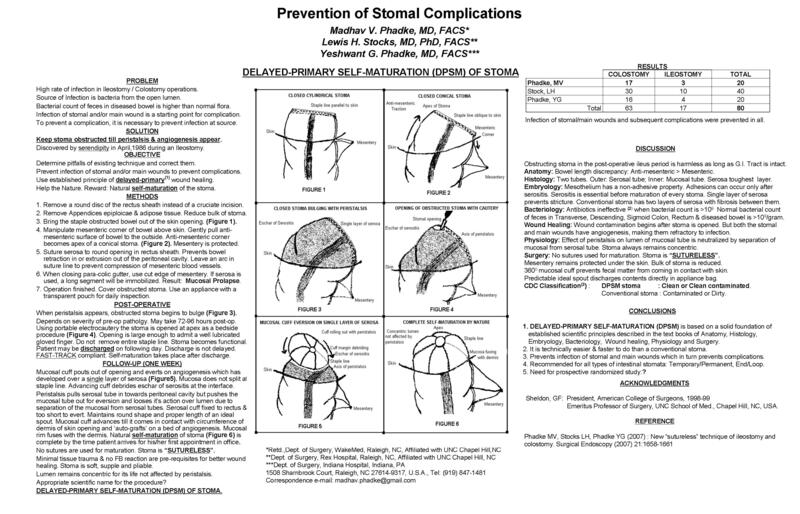 It was recognized that primary maturation of any stoma is not necessary. It is potentially harmful to open the stomal lumen on the operating table to suture the mucosa and serosa to the dermis of the skin. An open lumen allows the bacteria to exit and contaminate the stomal and main wounds and start infection on the operating table. The infection results in a complication. The simplest and easiest way to prevent the bacteria from coming out of the lumen is to keep the lumen obstructed. This iatrogenic obstruction of the small or large intestine has no deleterious effect on the post-operative course of the patient because of the paralytic ileus that happens in each and every patient. Once the peristalsis starts, the obstructed stoma bulges and is then opened as a minor bedside procedure. The mucosal cuff protrudes out of the opening and everts. The eversion takes place on a bed of granulation tissue. This is based on Delayed-Primary wound healing. The mucosal cuff is pushed by peristalsis till the circumferential margin of the cuff comes in contact with the dermis of the opening at the stomal site. The entire maturation process is automatic and done by the Nature (Self-Maturation). The effect of peristalsis on the mesenteric corner of the stoma is abolished by bringing out the obstructed stoma in a conical fashion at the time of the operation. During Self-Maturation the mucosal tube gets separated from the serosal tube. Peristalsis continues to exert its effect on the serosal tube but not the mucosal tube and the lumen of the stoma. This prevents the delayed complication of excoriation of the skin because the stomal lumen remains concentric for the life of the stoma. Using the DPSM technique, 100 cases were performed. 85 were Colostomies and 15 were Ileostomies. Infection and complications were prevented. Minor complications were handled easily. Patient satisfaction was excellent. Primary maturation of stoma is unnecessary and potentially harmful and should be replaced by DPSM. It can be performed in all types of stoma construction, end or loop, temporary or permanent. It prevents infection and complications in all patients.